I wrote back to tell Kelly that I am a huge Roycrofters fan, and a fervent admirer of the Arts and Crafts movement. About 15 years ago, a wonderful Roycrofters exhibit came to the Virginia Museum of Art and my husband and I, who were living in Charlottesville, VA, at the time, went and enjoyed it very much. We have some reproduction and some antique Craftsman furniture, and I actually made this quilt to compliment my living room furniture. 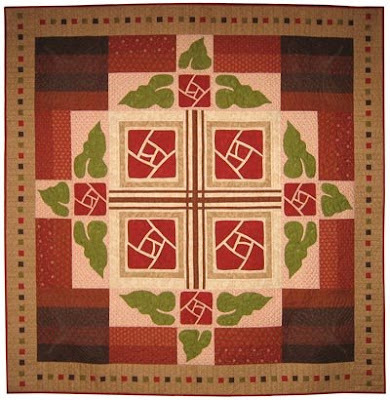 The Roycrofters were a handicraft community founded in East Aurora, NY in the 1890s. It became a well-known center of the Arts and Crafts movement in the United States. “I wanted something to really show who I am. Not to mention it is permanent so I MUST love it. Not an option otherwise. I had a very hard time finding anything I wanted and the couple tattoo artists I went to just couldn’t grasp what I was looking for. I happened to work with someone who dabbled in painting and art. So I told him what I wanted. 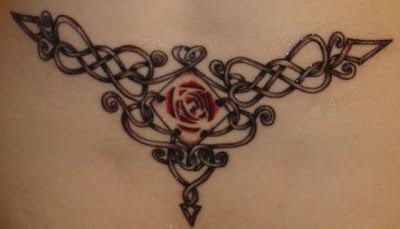 Something girlie, Celtic hearts and has to have THIS rose. (The Roycroft/Glasgow Rose) So this is what he came up with. “I am of Celtic descent on my dad’s side. It is just uncertain to whether we were Irish or Scottish. (I have red hair, fair skin and blue/grey eyes), but I have always been drawn to the Celts. For me it represents my heritage. “The heart to represent my love for most everything. Family, friends, animals, nature, etc. The Rose wasn’t an option. I always LOVED that rose from my days growing up. For me it represents home. Charles Rennie Mackintosh was part of "The Four" — a group of artists including Mackintosh, Herbert MacNair, and Margaret and Frances MacDonald — that grew out of the The Scottish Movement at the Glasgow School of Art in Scotland in the late 1880s and 90s. They are credited with popularizing the Glasgow Rose, which became one of the most famous motifs of the Arts and Crafts movement. It was adapted from Aubrey Beardsley, and used on furniture, pottery, stained glass, metalwork and other decorative arts. For more information, go to the website for the Charles Rennie Mackintosh Society.